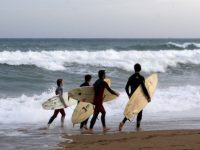 As we all know, Barcelona is a cultural capital, a cosmopolitan city, magnet of tourism in the Mediterranean, hence requiring more than one weekend, or at least five days, for use and enjoyment, but it is not always possible. 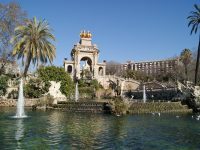 This is why we offer you in this post a selection of places you should visit if you travel in Barcelona for three days. By Anna Cuchillo | The route today we offer mixes tradition of Barcelona’s mythical places with the novelty of its people and environments, offering a weekend you won’t forget. First of all, the first recommendation is to travel by metro, Barcelona has a network of lines that reach almost all points of the city, so we will put them which you must use to reach each recommended place. We start at Plaça Catalunya, one of the neuralgic points of the city. It serves as a meeting point for all: locals and visitors. Here you have several metro and bus lines, the Catalan railways, Renfe and also taxi stop; if you are not there is also the Paseo de Gracia (L2, L3, L4), strategic and historical place of the capital, where you can find the chicest boutiques of the moment, some of the finest restaurants, and the most modern houses known. 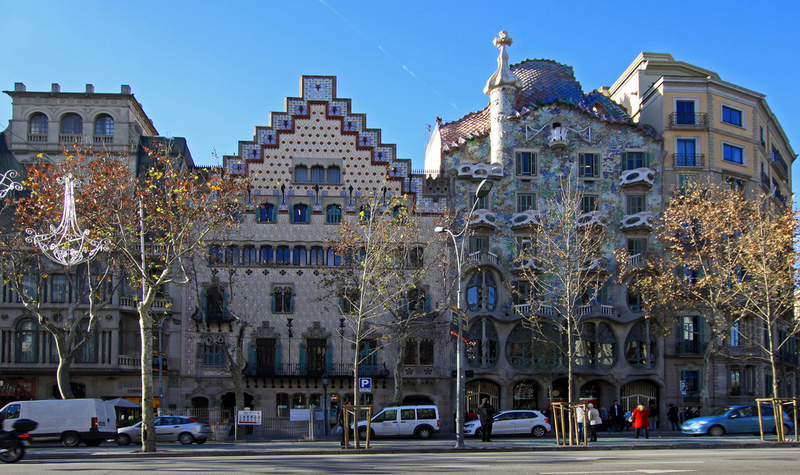 Ametller House and Casa Batllo are two of the buildings that make up the ‘Apple of discord’ in Barcelona. The first stop is La Sagrada familia (L2, L5). It is a place you must visit. We are not the one saying it, the statistics and the travelers’ choice 2015 list are. In this list, the Sagrada Familia is the fifth most visited tourist site in the world. A monument of great artistic beauty, the work of Antoni Gaudí, the Catalan modernist architect. It is the endless building. To this day and after years and years of work, the scaffolding continues to be part of this wonder. We advise that if you want to enjoy a guided tour of the interior, reserve the entrance in advance, since every day are forming very long queues. Casa Ametller y Casa Batlló are two of the buildings that make up the ‘Apple of discord’ in Barcelona..
Not far away, we have another great work of Gaudí, another construction that you cannot miss. It is the Casa Milà, better known as La Pedrera. In addition to the possibility of seeing the interior, preserved in perfect condition, visitors are offered magnificent exhibitions. The second stop will be a few streets down the famous block of discord, where three of the most modernist houses stand: the Casa Batlló, the work of Gaudí; The Casa Ametller, by Josep Puig i Cadafalch and the Casa Lleó Morera by Lluís Domènech i Montaner. Taking into account that it is Friday and Barcelona is a city full of life, we propose you to eat something in the neighborhood of Gracia. The area is characterized by its gastronomic variety, ranging from the cuisine of Eggs author, to the most typical of the Spanish tradition: Via outside, Le Papillon Barcelona … passing by the Karakala, specialized in gastronomy of the ancient Phoenicians. That is why we leave it to the need of your senses. Another option is to end your appetite in the oldest restaurant in Barcelona: Can Culleretes, (opened since 1786!) To which you can walk to Plaza Catalunya and down La Ramblas or take the L3 and get off at Liceo (Between 25 -40 E). La Rambla is one of the most famous areas of the city, so if you opt to get off by metro, we hope that once you have finished eating, you will walk across the Rambla and experience what it feels like snaking among hundreds of tourists and souvenir stands. 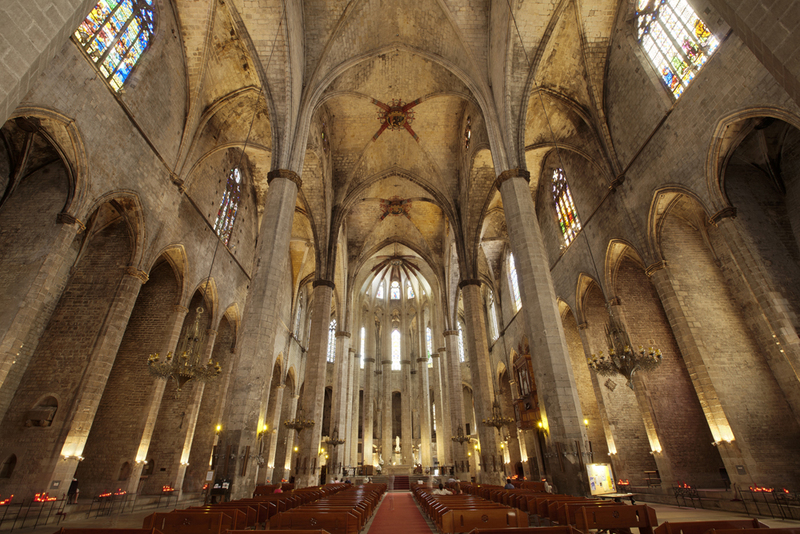 Santa Maria del Mar church is in the Ribera district of Barcelona. At the beginning of this street you have the Source of Canaletas, place of celebration of the fans to the Football Club Barcelona. And in the end, the harbor, where the Columbus point of view awaits you. Along the way, you will find the Gran Teatro del Liceu and the Wax Museum. Two great classics you should not miss either. Like El Bosc de les Fades, a dreamy place inhabited by fantastic beings and set in stories that moved their childhoods. Here you can relax while having a coffee and immerse yourself in a parallel world. 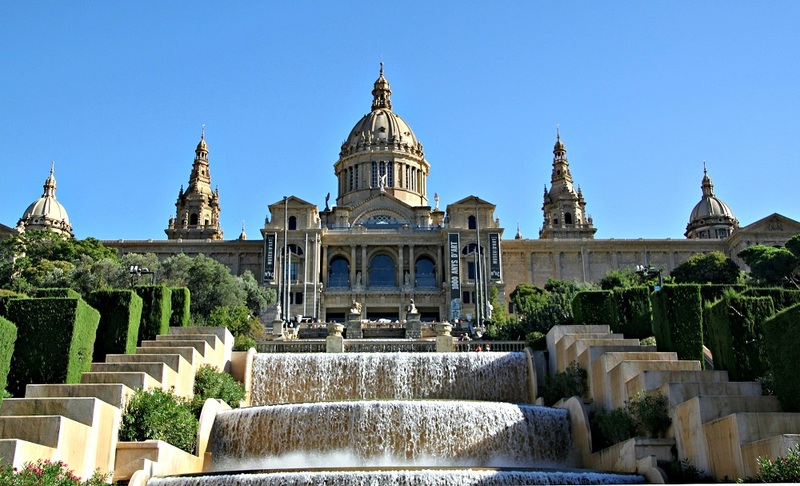 It will cost you to return to reality, but you must do it and take the metro (L3) to Plaza España, where you can visit the National Museum of Art, which has one of the richest collections on Romanesque; or access the Montjuïc area. If you have chosen to go up to Montjuïc, we recommend using public transport so you do not waste your strength. Once up you can see all of Barcelona from the viewpoint. You will be amazed by the panoramic view. Take the camera because the views are amazing. You can also visit the Ethnographic Museum, the Palau Sant Jordi, and the National Palau, the Torre Calatrava, the Spanish Village, the Olympic Stadium, the Grec Theater, the amusement park and the Montjuïc Castle. And if you are attentive, look at the moment when you can go to the big show of the Magic Fountain of Montjuic, which attracts hundreds of tourists with their play of jets and lights. This mountain offers many activities and especially in July, the month in which the Grec is celebrated, so it would be perfect if you had a whole day, but if it is so at least spends the afternoon strolling there and reveling in the views of the City and the Mediterranean Sea. If you still have strength and you are a night lover, we propose several itineraries: if you like the mysteries and you want to know the most sordid and terrifying stories of Barcelona, goes to the route of the Ghosts of Barcelona, organized by Icon, Serveis Culturals, and in which for the modest price of 11 euros can travel through these stories the typical landscapes of Barcelona from the Arc de Triomphe (L1: Arc del Trionf) to Santa María del Mar. If you prefer a relaxed family plan, you can attend the numerous theatrical performances offered, including the musical performances of the Gran Teatre del Liceu (L3: Liceu), the works of the Teatre Nacional de Catalunya (L1: Glòries) A more relaxed atmosphere, the shows of the Mill (L2 and L3: Paral·lel). Surely you are already tired, but cheer up, not every day you have the opportunity to stroll through a big city like Barcelona. For this second day, the first thing we recommend is to spend the morning touring the magnificent Park Güell (L3: Vallcarca), where you can see the designs made by Gaudí and stroll through its gardens. Due to the extension, the best idea is to spend all morning in it, so at lunchtime we recommend The Parc Güell turret, specializing in Mediterranean food. (20 euros). For the afternoon, we recommend returning to the city center to see the old town (L1, L3: Catalunya). From Plaza Catalunya you should go down the Corte Inglés until you reach the Cathedral, where we recommend entering the cloister to see the pond with hollows. According to tradition, there were as many years as Santa Eulalia had when they sacrificed her, which are thirteen. The Cathedral is the current headquarters of the archbishopric of Barcelona and is dedicated to the Holy Cross, and later to Santa Eulalia, patroness of the city of Barcelona. It was constructed in three stages during the centuries XIII to XV, on a Romanesque church that had been raised on a visigoda. Although later, in the nineteenth century, it was rebuilt by finishing the works with the current façade. An impressive cathedral that you must visit without fail, it is a building with its own life, named in 1929 National Historical-Artistic Monument. Following in the area of the Cathedral, specifically in the back, we recommend visiting the Museum of History of Barcelona, located next to the Archivo General de la Corona de Aragón; In the Plaza del Rey, where you can observe the historical character of the city, since the whole range from Roman to Medieval Barcelona. Just across the Rambla is the picturesque Raval district, born of the extension of the old medieval walls of the city. A multicultural area. One of the neighborhoods where people from different countries and cultures live. Losing the streets of the Raval can reach the Monastery of San Pablo, the Church of San Agustín, the Palace Güell, and the Museum of Contemporary Art of Barcelona (MACBA). Also in this neighborhood is the Mercado de San José, better known as La Boquería. A municipal market which is also can be accessed by La Rambla. In it you can find everything and is ideal if you want to snack something fast and rich. Since it has not been a very intense day, or not as much as the first one, we encourage you to stay up late. They say that once a year, it does not hurt. One suggestion is to have tapas dinner and start with a beer. If not you can also experiment with foreign gastronomy, from the Chinese and Japanese restaurant, to Vietnamese and Tibetan. Surely you have already tried dishes from the first two, but if you are curious about the last two we recommend the Potala (Tibetan located on the street Aragó) or the Kiu Nam (next to Hospital Clinic). In both restaurants the food is plentiful, so, beware! As you know the nights of Barcelona are young and we encourage you to go marching through the discos. The city offers a wide range of styles of musician in each of its premises, so we leave you a list with the best music venues. La Estrella herida (wound star), sculpture on Barceloneta beach. The last day of the trip arrives. After two exhausting days, we recommend you spend the morning in Barceloneta (L4), the mythical Barcelona beach where you can enjoy the warm climate of the city and relax after two exhausting days. You can either sit on one of its many terraces to take canes, lie down in the sand or stroll through the neighborhood, which still retains the charm of the fishing villages. To eat for the last time before returning to their respective cities of origin we recommend that you do not move from the area and taste one of their wonderful seafood paellas. Before you leave to your respective houses, we recommend going to the Park of the Citadel, a garden in which you will find a small castle and a beautiful fountain, the ideal place to spend the afternoon and on Sundays. There, groups of friends gather to relax, play sports, play guitar, walk the dog, and take a family stroll … A most pleasant atmosphere to finish the weekend and the trip. 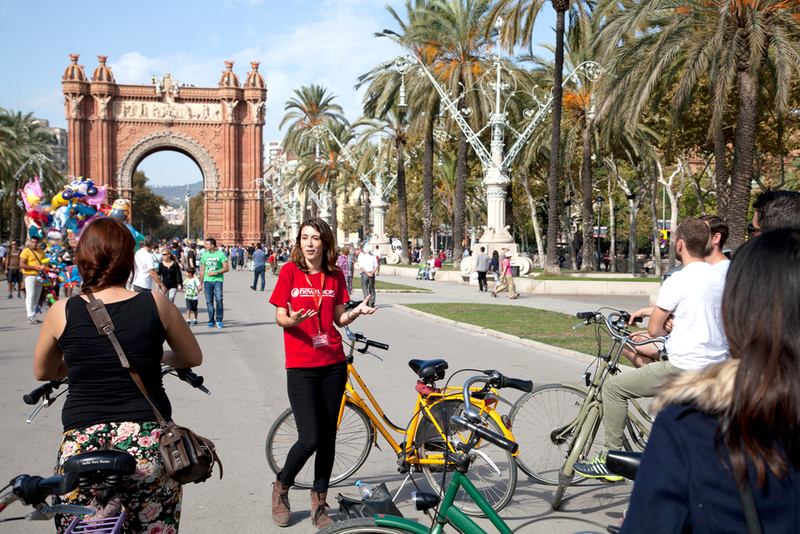 We hope you enjoyed them and take advantage of those free days you will have to visit Barcelona. And if you have already been here, we hope to have you here soon!